Fat White Family - Serfs Up!. Vinyl LP, CD. Bleep. We’re as pleasantly surprised as you to see a new LP from the Fat White Family. After all, this is a group who have seemed on the verge of imploding at any moment since they first emerged, slobbering and rasping, with 2013’s Champagne Holocaust. But not only do they seem to have ridden out the storm, they’ve also learned a thing or two along the way. Serfs Up!, the band’s third LP and first for Domino, sees the group maintain their fire while also fronting some of their most sophisticated arrangements to date. 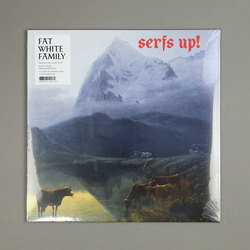 Shades of disco, reggae and Gainsbourg-style chansons now add finesse to the Fat White Family’s scrot-rock.